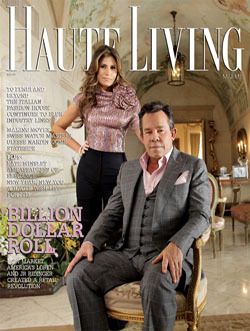 Loren Ridinger with her husband, JR, on the cover of "Haute Living." (Photo courtesy of Market America). The spoils of her hard work abound throughout Miami Beach. From the massive, gated North Bay Road compound (it does span three lots) she occupies with her husband, JR, who founded Market America almost two decades ago, and their daughter, Amber; to the two megayachts, Utopia II, a 118-foot craft, and an even larger vessel, the 157-foot Utopia III; and on through the chauffeured black Rolls-Royce sedan replete with the personalized "MA" license plate. Quite a contrast to the early 1990s when Loren Ridinger first set out in business. MA now has a presence in seven countries and continues to grow at a heart-stopping pace. To date, the company, which specializes in one-to-one marketing, has sold to more than 6 million buyers. It has amassed more than 180,000 worldwide customer managers and can claim nearly $3.5 billion in sales. That has resulted in commissions paid to the public that top out at better than $2 billion. Ridinger, who also oversees a publication of her very own, called "Motives," as well as an annual fundraiser called "Rally For Kids With Cancer," paused on the eve of the company's sold-out 2011 World Conference at the AmericanAirlines Arena in downtown Miami to speak at length with Aventura Business Monthly for its inaugural cover story. Q1: Can you share with us some of the earliest details from the founding of Market America? A: I was the office manager for the company at the beginning. JR was a consultant when we met and we immediately hit it off. He had both a brilliant plan and the vision for creating a company that would provide a business to enable anyone to create financial freedom for themselves. At the time, I was only 18 years old. But JR is brilliant, and his plan was brilliant. I'd never seen anything like it. As young as I was, I was also very outgoing, persistent, and motivated. I believed in JR's vision and encouraged him to start the company. Along with my brother, [current MA Chief Operating Officer] Marc Ashley, we set our goals and began Market America. Q2: Did I read correctly that just like Bill Gates and Microsoft, MA began with a ton of determination and some awesome ambition inside someone's garage? A: Yes. JR and I started Market America out of our humble home in Greensboro, North Carolina. Our dining room was the boardroom, our garage the shipment department, and our bedroom the office. We had many challenges when starting the company, but we knew we had what it takes to make it happen, and we never gave up. Some of the earliest challenges we faced were funding, identifying the right products, negotiating prices with suppliers, and [dealing with] the naysayers. Nevertheless, we maintained our belief, commitment, and passion. Q3: Were you at all overwhelmed by the challenge of adapting to and customizing your business model when Web use exploded in the mid-to-late 1990s? A: I believe we are always evolving. We are continuously incorporating new developments, trendsetting products, and technologies that will enable us to enhance our business. I didn't see us being overwhelmed with the transition. This was something that needed to be done in order to progress. I think, for the most part, we were ahead of our time. Of course, there were some who didn't believe in online shopping; they were stuck on the idea of mall shopping in traditional brick-and-mortar stores. Q4: What was the public's initial reaction to MA? A: In the early stages of Market America, many people didn't believe in online shopping. It was something consumers had to get used to because they were so accustomed to shopping at malls and retail stores. So our business really was built from the ground up by word-of-mouth. Our first presentation was with less than 25 people. But they started to experience positive results using our products and began to make money implementing our business system. That led to more people who wanted to use the products and were interested in learning about the business. Q5: Was there a singular moment you can point to when you realized MA had "arrived" or was it always more organic? A: I can't say there has been a point at which I had a feeling that we have "arrived." The closest feeling, or a memorable moment, is when JR spoke on Bloomberg TV in regard to Market America's acquisition of Shop.com. There have been many magical moments of our growth, but I feel we have much more to accomplish. We are still at just the beginning. Q6: Is the Shop.com deal complete and had that been a domain you'd been eyeing for a while? A: The acquisition is now complete. The deal is something that came to us from the sky. We weren't looking to buy a company, and as attractive as the domain sounds, we were always happy with our domain name, MarketAmerica.com. I think this deal will become a worldwide movement that will give us the opportunity to compete with Amazon.com. It represents a paradigm shift to online comparative and social shopping. It puts Market America on a billion-dollar roll in the online shopping space. Market America and Shop.com are synergistic, and we're in position to combine the experience and strengths of both companies. Together, they are going to be catalytic in changing the way people shop. Adding Shop.com's technology, its one-cart checkout system (which originally was created for Amazon), and its traffic, combined with Market America's people power, will make for the ultimate shopping experience and put us on the forefront with other giant shopping sites like Amazon and eBay. Q7: Why was the move made to take MA back to operating as a privately held company after being publicly traded? A: The securities market never reflected the performance of our company. We simply wanted to focus on investing our money back into the growth and development of the company. Also, something to take into account is that MA was growing at a very fast rate, and even with our rapid growth, the market did not recognize our performance, and to this day we don't know why. So instead, we decided to invest in ourselves. Our time, sweat, and tears, to the company. Q8: What do remember about the first MA World Conference and what's in store in 2011? A: Our first World Conference had a little less than 100 people. At the time, we were just starting and beginning to build momentum. We had a handful of individuals who caught the vision of the company. The growth of our company was entirely grassroots. For the 2011 World Conference, I'm really looking forward to the launch of my new solution-oriented product line, Fixx. Ken Paves will be on stage to launch "Hear You Wear," a hair-extension line. There are also our "Paid to Shop" and web-portal presentations, and the convention, of course, wouldn't be complete without JR's business-building presentation and closing finale. But I have to say the conference is extra special this year because we will get to showcase the importance of the integration between MarketAmerica.com and Shop.com's technology, finally being able to legitimately challenge Amazon. Q9: To what component of the company are you most devoted at the moment? A: I try to devote as much as I can to all of the divisions of the business, and I have a great team of people that helps me. For the moment, my main focus is the production of Fixx, which I predict will be one of our best-selling products. There isn't one aspect of the business about which I am not passionate. I treat them all equally. I have Motives Cosmetics, Cellular Laboratories, Loren Jewels, Fixx, MyFashionCents.com and LorensWorld.com, and not to mention, I am the Senior VP of Market America, overseeing all of the creative and marketing [functions] for more than 30 internal brands. I try to divide as much time as possible to all of the brands, and to our "Paid To Shop" program. Motives is my most profitable brand. But my other brands are very young and already performing well. I still have one more brand that has not launched yet and already is buzzing in the industry. Q10: Looks like quite a few of your friends from the entertainment biz are contributing to the marketing of your jewelry. How did the idea for your own line come about? A: The line was created for fun. It wasn't something I planned on doing. I love jewelry and my friends love jewelry. I'm an avid collector, so I thought it would be fun to create jewelry that my friends and I could wear. It just so happens most of my friends are celebrities, and they began wearing my line to red carpet events and referring me to other people. Suddenly, I got a call from "InStyle" magazine, wanting to feature my bracelet as one of Jennifer Lopez's favorites. I only had 12 pieces and really didn't have a brand, but when opportunity knocks, you have to take it. I realized there's a void for jewelry to be fun, chic, and elegant that can transition from day to night. All of my friends wear the Loren Jewels they love, and they're always requesting it, like Eva Longoria, Alicia Keys, Jennifer Lopez, Kim Kardashian, Paulina Rubio, Jessica Simpson, and so many others. They wear it because they like it. I don't pay them for endorsements.